Aerial view of the Wadbury valley (click to enlarge view). Mells and the nearby Wadbury valley display some fascinating geology and industrial archaeology. The village is located on the northern flank of the Mendip Hills, where the Triassic and Jurassic rocks lap onto the older, highly folded and contorted Carboniferous Limestone and Coal Measures. The Carboniferous Limestone forms the extensively quarried higher ground south of the village, with the softer coal-bearing mudstones outcropping to the west. North of Mells, the Jurassic Inferior Oolite and the overlying Great Oolite Group overlie the Carboniferous strata and form the escarpment of Newbury Hill and Mells Down. From Mells, the most spectacular geology and industrial archaeology can be seen on a walk down the Wadbury valley. Here the Mells River flows through a narrow valley excavated in the harder, steeply dipping Oxwich Head Limestone. The Wadbury valley contains some fascinating industrial archaeology. Three of the six Fussell's iron works occur here, which in their heyday in the 19th century produced some of the finest edged tools in the country. The Upper Works were located on the bend of the river at the head of the Wadbury valley. A few hundred metres down stream are the remains of the Lower Works, while the remains of the Great Elm Edge Tool Works lie about 150 m downstream of the confluence with Fordbury Bottom. Near the upper end of the Wadbury valley is the outfall from Whatley Quarry. Groundwater from the quarry is pumped here to help maintain river flow and to help recharge the underground aquifers. Just downstream is the Mells River Sink, a cleft that acts either as a sink or a spring depending on the relative levels of the river and the water table. The rift in the hill above the sink is a cave developed along the line of a 'Neptunian dyke', a fissure in the Carboniferous Clifton Down Limestone infilled with younger Jurassic Lower Lias Downside Stone. The narrow densely wooded valley and the old iron works support a rich diversity of mosses, liverworts and ferns. The hart's-tongue fern is particularly common along the river banks. The old iron works are also important bat roosts. Further down the valley near Great Elm is the prominent entrance of Spleenwort Shelter, a short cave developed in the Carboniferous Clifton Down Limestone. 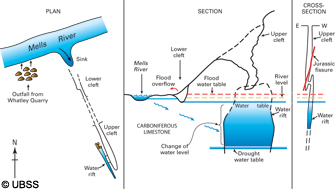 Cross-section and plan of Mells River sink (click to enlarge). Map of Tedbury Camp Quarry (click to enlarge). Copyright Martin Whiteley Barrisdale Ltd.
Tedbury Camp Quarry provides one of the best and most accessible exposures of the unconformity between the steeply dipping, massively bedded, grey Carboniferous Clifton Down Limestone and the overlying horizontally bedded, yellow Jurassic Inferior Oolite. Although the quarry is disused, it is still owned by Hanson Aggregates who allow access to the site. A large flat area of rock has been exposed where the Inferior Oolite has been stripped in preparation for blasting. This surface was once the sea floor in Jurassic times and is encrusted with fossil oysters and the underlying Carboniferous Limestone has been bored by worms and bivalves. These borings have been infilled with Jurassic sediment.